The arrest of Ai Weiwei at Beijing airport on April 3 has had various outcomes, some predictable, others not. Among the predictable ones has been the huge enlargement of his reputation. If you had not heard of China’s most famous dissident artist before his detention, you must surely have heard of him now. Stupidly, the neanderthals who run China have made their best-known naysayer better known. The international art world, too, has behaved with predictable anger and noisiness. Petitions have been launched, signs put up, pronouncements made, exhibitions dedicated. Most of the time, the art world is a politically toothless assembly of unusually selfish people — but when an outsider hurts an insider, we gang together and unsheathe our claws. For Ai himself, heaven knows what terrible fates have been visited upon him. If he is in a typical Chinese prison, the poor man will have been animalistically degraded while the thought police submit him to one of their grim campaigns of character realignment. It will not work. Nobody has ever come out of a Chinese prison thinking differently from the way they went in. They merely weigh less and feel even angrier. All this is predictable. Yet, since the Fates have decided to stick their oar in as well, by ensuring that two Ai Weiwei displays are simultaneously available in London, we need also to look at the misunderstanding of his art encouraged by the current situation. Stupidly, again, the Chinese authorities have ensured that Ai is understood principally as a dissident who attacks his own government. But that is not what he is. What he is is a conceptual romantic who expresses his dismay at the relentless trashing of the past by a crude and cruel modernity. Which is our problem as much as China’s. A good example is the surveillance camera carved out of marble that surveys us doomily from a pedestal in the Lisson Gallery’s Ai Weiwei show. Yes, surveillance cameras are sinister objects. Yes, marble is a noble and exquisite material. Yes, if you carve one out of the other, you highlight an immediate clash of values and timescales. But anyone who imagines that Ai’s marble surveillance camera is intended only as a criticism of the Chinese authorities who have imprisoned him needs to look out of the window of the Lisson Gallery at the surveillance cameras trained on the door. There’s nothing Chinese about those. Or about any of the robot eyes that make us Britons the most watched people on earth. China didn’t invent shoddy urban development, either, of the sort that is graphically highlighted by Chang’an Boulevard, a 10-hour video piece, also showing at the Lisson, in which the artist pauses at intervals to examine a 30-mile road that crosses the length of Beijing from east to west. If Chang’an Boulevard were called the North Circular, it would make exactly the same point and would offer, I suggest, an even more depressing spectacle. The real subject matter here, as it is in Ai’s giant sunflower-seed installation in the Turbine Hall at Tate Modern, which closed earlier this month, is the victory of mass production over skill. The triumph of capitalism. The replacement of the handmade by the cheap-to-sell. The rise of the shoddy. It’s a particular problem in modern China, and was grotesquely speeded up during the evil preparations for the Beijing Olympics, but it is also a problem everywhere else. China did not invent flyovers, skyscrapers, concrete wastelands or any of the grim urban sights glimpsed from the ring road in his video. Unfortunately, since Ai’s arrest, the fact that he is as much against McDonald’s as he is against the ruling party is harder to see. n truth, lots of his messages are elusive. Switching formats constantly from video to woodcarving, from painted pots to carved white marble, he manages simultaneously to appear ultra-modern and ultra-traditional, very conceptual and very tactile. All over the Lisson Gallery show — a survey of pieces made since 2004, planned before the arrest — there are resounding clashes of values. Outside, in the gallery’s sculpture court, a huge hoard of 56 exquisitely carved marble doors has been haphazardly stacked, as if dumped in a reclamation yard in Vauxhall. Each one is a careful reproduction in marble of the countless wooden doors ripped out of the ancient cantons during the “rebuilding” of Beijing. The funerary air here is appropriate and deliberate. Every white door is a monument to an unknown life discarded by “progress”, disposable, brutalised. Inside the gallery, two empty marble chairs displayed side by side in the show’s most haunting vista boom out another silent ballad on missing presences. All this is fascinating, calm and exquisite. What it isn’t is exciting. The Lisson Gallery doesn’t really do excitement. It usually favours the thoughtful over the emotional. That is also true of Tate Modern, whose gigantic Ai installation lost most of its visceral impact once the public was stopped from walking across it. Without the crunching underfoot, Sunflower Seeds was half the work it was. For a truly exciting bit of Ai, you need to experience Circle of Animals, his brilliant installation in the courtyard at Somerset House. Already a magnificent space, this huge neoclassical clearing has allowed in a fantastical set of sculptural trespassers from the ancient Chinese zodiac. 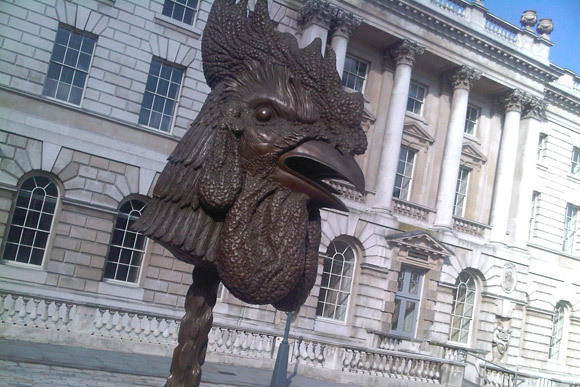 Twelve giant animal heads, cast in bronze, have been arranged in a semicircle at the bottom of the courtyard, the end nearest the Thames. There’s a snarling pig and a grimacing horse. A sneering rat and a hissing snake. A roaring dragon and an aggressive, wild-eyed cockerel. Each is a magnified version of the 12 animal heads commissioned by an 18th-century Manchu emperor, Qianlong, for a zodiac fountain at Yuanming Yuan, a palace outside Beijing. So they were created more or less at the same time as Somerset House. Britain and China are shaking hands across the ages. They are also eyeing each other up with scary aggression. Enlarged to mutant size, open-mouthed from their previous job as waterspouts in a fountain, Ai’s zodiac animals now seem astonishingly fierce. The rabbit will chill your soul. The pig snarls as savagely as a tiger. The cockerel, with all that hideous wobbly flesh around its face, seems to have reversed evolution and returned to the Tyrannosaurus rex stage. Chinese zodiac animals, remember, are guardians of human destiny, caretakers of the future. So I’m glad I don’t believe in all that ancient mumbo jumbo. Otherwise, right now I’d be really scared. What an improvement this is on the shoddy ice-skating setup that spends the winter here, and constitutes exactly the kind of cultural cheapening that Ai Weiwei complains of in his work.